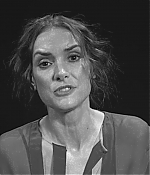 Winona Ryder gushes about her love for Keri Russell on her favorite TV show, ‘The Americans’ in the latest installment of Screen Tests. As we get ready for ‘Stranger Things 2’ on Netflix, the actress who plays Joyce Byers on the show talks about her first kiss, her time on the skateboarding team, and her mastery of the yo-yo. And of course, Abby was right. 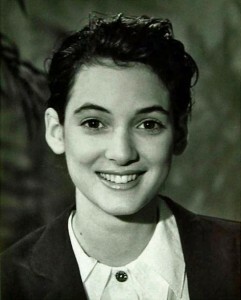 Looking back twenty-five years to the opening of Lucas and to the first time the cinema-going public first cast their eyes on Winona Ryder, most agreed that, even though she would only appear in eight scenes and her role as Rina almost seemed like an afterthought, it was enough to get Winona noticed and confirm the kind of character she would play for the next five years of her career: the alienated teenager. If there was any doubt, one only had to take a look at the press kit for the movie, which described Winona as â€˜fragile with a certain poetic justice.â€™ And the critics agreed. The New York Daily News credited â€˜Winona for turning a small part into a memorable oneâ€™, and Variety’s Todd McCarthy remarked that Winona â€˜constantly but quietly stole all Kerri Green’s scenes.â€™ Roger Ebert writing in the Chicago Sun Times said it was easily â€˜one of the yearâ€™s best filmsâ€™ and doubted if anyone of any age could give a more sensitive and effective performance.â€™ In fact, there werenâ€™t many critics that didnâ€™t rave about her performance. According to the general consensus, it was â€˜deft, remarkable, and fetching.â€™ So perhaps it is no wonder that Winona had the critics on her side even before the film was released twenty years ago today. Lucas opened on 628 screens in the United States on 28 March 1986 and during its opening weekend had taken $1,250,101 at the box office, ultimately its gross topped eight million and earned itself three Young Artist Award nominations. If you want to read more about the making of Lucas, there is more behind the scenes info in Nigel’s biography of Winona, which is curentlyÂ available from AmazonÂ as a POD paperback and eBook. We are pleased to announce that Nigel Goodall’s biography of Winona will soon be available as a Print On Demand (POD) paperback. The POD will have existing eBook front cover artwork, with a new back cover that will be a graduated matching colour to the front cover with descriptive text. The interior text of the book will, of course, be the same as the eBook version. It is to be made available via all normal book retailers, wholesalers and via Amazon in the UK, Europe and the USA. Release date is yet to be confirmed. In little more than ten years, and by none of the traditional routes, Winona Ryder has firmly established herself as the single most exciting actress of her generation. 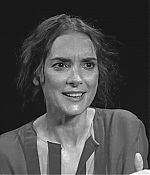 A child star who literally grew up in front of the camera, Winona is the first American actress since Natalie Wood to successfully transcend a career from adolescence to adulthood. From her first moments on screen when she sidled out of a crowd of teenage children in David Seltzer’s Lucas and said “Hi! 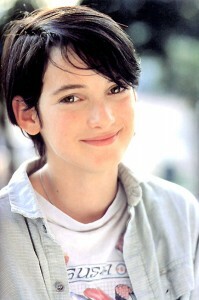 How was your summer?” Winona Ryder has been someone to watch. Her alert, expressive eyes telegraph a startling combination of intelligence, gravity and self possession rarely seen in the cinema today. Intensely private, secretive, and guarded, Winona Ryder has been a public figure for more than half her life, and whereas her private persona remains an unwritten book, her public life demands attention. Now only in her mid-twenties, Winona is still growing as a person and developing as the most admired and important actress. Now, this definitive biography traces how she came to arrive in Hollywood to make her motion picture debut at the age of thirteen, and how she reached the enviable postion of building a career strictly on her own terms by carefully avoiding the brat-pack blockbusters and rejecting the advice of agents, directors and other Hollywood insiders. The book charts how Winona has won the respect and admiration of fans throughout the world with her offbeat beauty, fiery intelligence, wry wit and quirky charm through her early teen misfit roles in such classics as Beetlejuice, Heathers and Edward Scissorhands, and how her Academy Award nominated roles in The Age of Innocence and Little Women established her as a serious and respected actress, to her later mature roles in The Crucible, Alien Resurrection and Woody Allen’s Celebrity. It tells a uniquely different Hollywood story from Winona’s unconventional childhood raised on a California commune surrounded by such counterculture figures as Allen Ginsberg, Lawrence Ferlingetti, and Winona’s late godfather, Timothy Leary; of her troubled school years, from being vicously attacked by school bullies through her independent home study to enrolling in drama classes at San Francisco’s prestigious American Conservatory Theatre, making her first fillm, and borrowing her name from Sixties rocker Mitch Ryder. The book gives a detailed account of a remarakbale career in a decade of making over twenty films that has included notoriety of being engaged to Hollywood rebel Johnny Depp; of her dedication to the search for missing children through her crusade to find kidnapped, and later murdered child, Polly Klaas; and of the drive that causes her to be constantly working even through physical exhaustion, and her refusal to conform to the Hollywood ideal of fame. 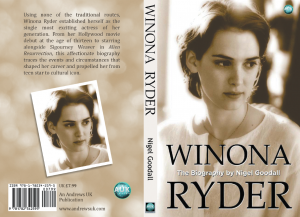 This affectionate and immensely readable biography is based on Winona Ryder’s own memories and recollections through her media interviews as well as those from friends, relatives, directors, colleagues and co-stars. 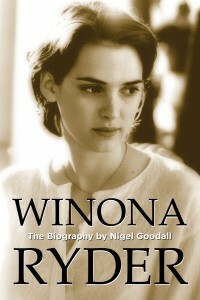 The book was the first British biography of Winona to be published in 1998. It was nominated for the Samuel Johnson Prize for Non-Fiction, became a Daily Telegraph bestseller, and the source for several major TV documentaries transmitted in the UK, USA and Canada. The book also won its author, Nigel Goodall, recognition as Ryder’s key biographer. His research archives still serve to this day as a primary resource for television, magazines and libraries. An eBook edition of the original paperback, with new cover design, and completely revised by restoring passages cut out of the original manuscript together with the addition of new material that covers the same period of the original print edition, was made available, under license from Nigel Goodall, in 2010 by digital distributor Andrews UK. This is kind of cute. Back in 2006 when Sienna Miller was shooting the movie “Factory Girl” she was spotted with a cropped do. Today it was published an interview at People website, in which she revealed it was inspired at Winona’s haircut. So, do you think it was similar? 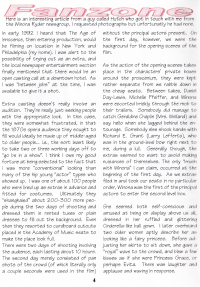 The following article, originally published in the Winona Fanzine UK, was written by a fan who describes how he landed a part as a crowd extra in the opera scene for The Age of Innocence. In early 1992, I heard that The Age of Innocence, then entering production, would be filming on location in New York and Philadelphia (my home). I was alert to the possibility of trying out as an extra, and the local newspaper entertainment section finally mentioned that there would be an open casting call at a downtown hotel. As I was “between jobs” at the time, I was available to give it a shot. Extra casting doesnâ€™t really involve an audition. Theyâ€™re really just seeking people with the appropriate look. In this case, they were somewhat frustrated, in that the 1870s opera audience they sought to fill would ideally be made up of middle-aged to older people…i.e, the sort least likely to take two or three working days off to “go be in a show”. I think I owe my good fortune at being selected to the fact that I was more “conventional” looking than many of the hip young “actor” types who showed up. I was one of about 100 people who were lined up as extras in advance and fitted for costumes. Ultimately they “shanghaied” about 200-300 more people during the two days of shooting and dressed them in rented tuxes or plain dresses to fill out the background. Even then, they resorted to cardboard cut-outs placed in the Academy of Music seats to make the place look full.